There are few bits of gear that are as cheap, light and easy to throw into your backpack or fanny-pack as a mylar emergency blanket, yet that can do as much to keep you safe in an emergency. This is one item that you should never leave at home. This may sound a bit extreme, and I’m possibly overselling it a bit. But I got thinking about the topic after Philip Werner over at SectionHiker.com posted a question asking his readers whether they carry an emergency blanket when they go hiking. As it happens I’ve been carrying a small emergency space blanket with me for years (although these days I’ve upgraded slightly, read on and I’ll tell you how and why). But first let’s look at when and why you ought to carry some sort of space blanket on most of your outings when hiking or climbing. I first started packing a space blanket when I worked as a volunteer paramedic. We were all issued with these as part of our standard first-responders kits. They were seen as useful aids to helping keep patients stabilised when they were going into shock after an injury. Since then I figured that the weight penalty of carrying one was so slight that I packed one into the lid compartment of my backpack and have had it with me on just about anything from local hikes to climbing Mount Mera at 6,400 meters in altitude. The logic behind space blankets is based on the idea that we lose heat mainly in three ways. The first is convection, whereby heat from our bodies is transferred to colder air (or water if wet) around us and is then lost to the environment. The second mechanism is by radiation, where heat is “beamed” away from our bodies as infra-red ration. This is the same mechanism by which the sun heats the earth or a grill cooks food. The third way is evaporation, where our bodies heat water and this then evaporates off us, taking heat with it. A space blanker offers some protection against all three. It reduces convection and evaporation by providing a barrier to wind and the movement of air (it can also help keep you dry if it is raining). It also helps reflect back some of the radiant heat that your body is losing. Considering their very light weight (often about 60grammes or less than 2 oz) they offer a remarkable level of protection. But they also provide a false sense of security. They are very thin so do not provide very much insulation on their own. If you have ever tried to sleep in one, or used one as a ground mat, you will realise very quickly that they are a poor substitute for a proper sleeping bag or real blanket. The guys over at Traditional Mountaineering have complained that they are dangerous and provide a false sense of security. I agree to a point. If you are going to be stupid enough to leave behind your proper insulating layers because you think that a wafer-thin mylar emergency blanket will be enough for you in very cold conditions, then you are putting your life at risk. If you pack it as a sensible additional bit of kit, then it makes sense. I mentioned earlier that I used to carry a space blanket but have now upgraded. So what do I use these days? The first product that I now routinely throw into my bag is a variation of the space blanket that is shaped as a jacket. I haven’t had to use it yet so can’t comment on whether it is much better than a normal space blanket. But it seems to solve many of the problems with existing space blankets in that you can seal it around your torso and head to provide a waterproof and windproof layer, whereas a normal blanket will flap in the wind. More important is that you can walk and move with this, so if you are mobile (in other words not injured) you have the choice of trying to make your own way to safety. I don’t use this as a substitute for a proper warm gore-tex jacket and insulating layer. But it is a useful addition that I think is worth the low cost and minimal weight of throwing one into my pack just in case. Since I’ve had kids, however, I’ve started carrying a new bit of survival gear when I take them out onto the hills and that is something that is quite popular here in England, but that doesn’t seem to have caught on much in the United States. It is a small survival shelter. 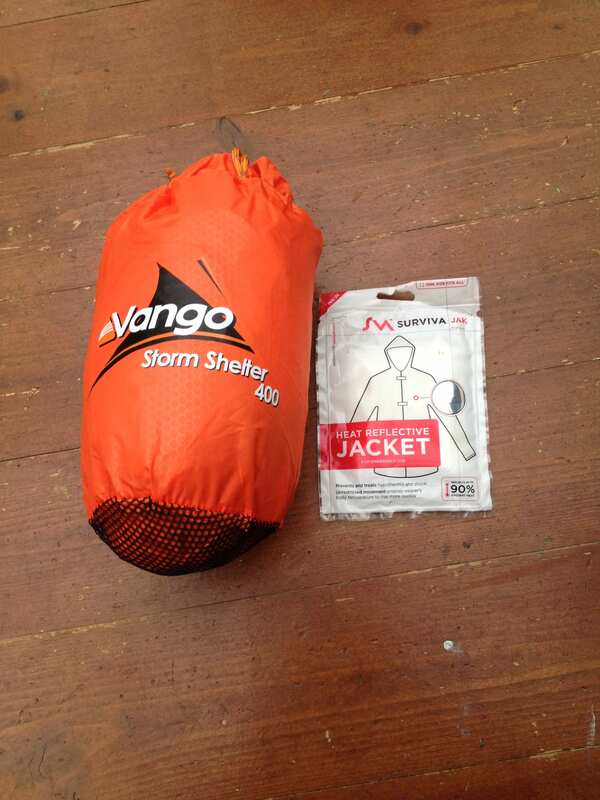 The version I use is made by Vango and is basically a square of waterproof tent material with breathing holes and a small window. It is big enough for four people to huddle under while sitting upright (see the picture below). This isn’t the same as a sleeping bag, and is a bit heavy (about 550 grammes or 19 oz) compared with a space blanket, but it is great for a group. The first advantage is that it gives you a quick and easy shelter to pop into if you want to have lunch (no cooking though) or read a map. It also warms up quite quickly from your breath and helps you share heat. This is especially important for me with small children as I will help warm them up. 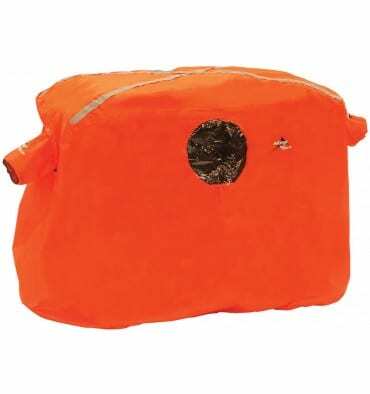 It is also very visible and provides a good waterproof and windproof shelter if waiting for rescue. It doesn’t have a bottom, so you need to sit on your packs, and you can’t lie down in it, but it is hard to beat. I don’t know why these haven’t caught on more elsewhere in the world given how useful they are. A third option is a survival bag. This can take the form of a cross between a mylar blanket and a sleeping bag. A popular version is the adventure medical thermal bivvy. This is made of thicker, stronger material than traditional space blankets so won’t rip easily. It also offers slightly better insulation from its thickness. As important is that it is shaped like a sleeping bag, so you can seal yourself in to keep out cold air and wet. When I first started hiking in South Africa 30 year ago we used to use something a bit less high-tech but also effective. This was a heavy-duty plastic bag in the shape of a sleeping bag. You could curl up in it to try to keep warm and on several occasions when crossing rivers I popped by backpack in it, held the top closed, and swam across with my gear staying dry. Whichever system you choose to use, make sure it is backed up by common sense. And have fun out there.